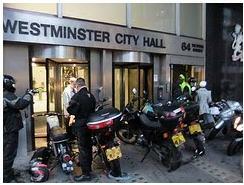 We have today come across a brand new group of campaigners against the parking tax imposed on motorcyclists by Councillor Danny Chalkley in the Borough of Westminster. A group of campaigners that we have never seen before, called the RATS. We didn’t actually know that RATS didn’t like the idea of a bike parking tax, to the contrary, we would have thought that RATS liked anything that smell something bad, something that looks strange, in need of some serious investigation. So who are they, these mysterious RATS? We are sure that Westminster City Council would qualify them as trouble-makers, while we think they are a lovely group of Riders Against Tory Stealthtaxes. Yes, that’s what they are, lovely and innocent riders, independent from the No To Bike Parking Tax campaign, who didn’t know where to park their bike this morning, and were totally unaware of the trouble that they would cause to Westminster City Council’s schedule on a rainy Monday morning. These RATS, of course without realising what they were doing, blocked the main entrance to Westminster City Hall for a good couple of hours this morning, thus delaying the start of the scheduled Partners in Parking (PiP) meeting and forcing all Westminster City Council staff to get into the building through the back door. How hilarious! When we found this out, not only could we not stop laughing for a few minutes, but also, were we delighted to hear that a meeting to discuss a possible illegal scheme under European Union law, which is being the subject of an investigation by the Commission of the European Communities and a public inquiry demanded by thousands of bikers to the Department of Communities & Local Government (DCLG), was being delayed. Westminster City Council’s parking chums have tried to encourage other councils to join their PiP scheme, by paying a nice and comfortable fee in exchange for their parking infrastructure, which includes the worse than atrocious Verrus pay by phone system. Not only Westminster City Council are suspected not to have carried out the required tender process under European law to introduce the Verrus pay by phone parking system in their borough, but also they have been encouraging other councils to use that system, through their PiP scheme, thus making them avoid the required tender process. We are sure that the RATS will always be welcome by Westminster City Council, after all, they are so lovely and easy going. They go straight to the point, don’t mess around and cause disruption. What else do Westminster City Council need? In the meantime, the RATS have published a video on Youtube to give you an idea of what they’ve been doing… and it sounds like they will be back soon for some more action! What a nice and convenient way to park for free in Westminster! Westminster Council are doing anything they possibly can to make themselves look foolish. Why charge bikes to park, it doesn’t make any sense. Well done, RATS, that’s all I can say. It sounds like this London council is getting into serious trouble. No authority in Canada would like to be in this position. I’m from Montreal (Quebec) and I find it unbelievable that bikers in London have to get to this stage to get rid of an unpopular tax. Why has this campaign been going on for more than 12 months now? How come these politicians have still not understood that their policy is refused by the public? There’s no way I would let something like this happen in my country. I’d love to be a RAT too, the whole thing sounds like great fun. Well done whoever did this. Carry on! This could be the begining of a “chain reaction” never seen before against Westmonster council ! Rats are cool ! « When are NSL Services going to hire Kim and Aggie?